Give the gift that keeps on giving – a flask to get them through the bachelor party and beyond! Engrave their names with “Groomsman” or “Best Man” underneath to show the guys how much their (sometimes grudging) participation was appreciated for your big day. Thoughtful and personal, these flasks – available in gunmetal finish or wrapped in black leather – are a masculine way for your groom to thank his Bros without getting “mushy” about it. Flasks are $25, plus engraving. So affordable! And yet, such a classic keepsake! For more deals like this, be sure to sign up for Things Remembered’s complimentary bridal newsletter here and then visit any Things Remembered store to receive your complimentary keepsake heart, custom engraved just for you. 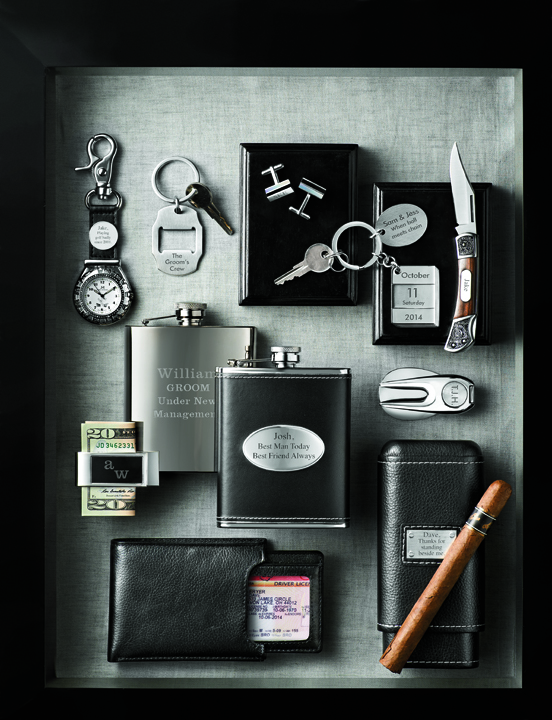 7 Comments " Groomsmen Gifts by Things Remembered - Sponsored Post "
These are great gift ideas for the guys! This is great! My boyfriend's brother got my boyfriend a pocket watch for being his best man and he absolutely loved it! The sage really makes the cranberry look so rich. Swooning right along side you. Love those flowers! Love how the cranberry just pops in this palette!